Strong, anatomically shaped vinyl guards. Two wide hook and loop fasteners provide firm fit and keep the guards in place. 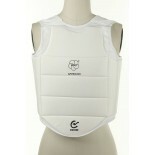 The use of excellent foam padding guarantees great shock absorption. 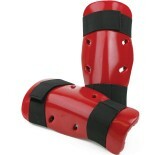 Color: BLACK, RED, WHITE Size: CHS, CHL, S, M, L, XL ..
Our shin protectors are made of light weight dipped foam, making them sweat proof and washable. 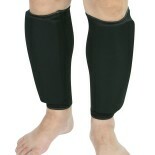 Anatomically pre-shaped with a reinforced foam layer over the shin bones. Two elastic straps featuring hook and loop fasteners ensure a proper fit. Ventilation holes mitigate excessive sweating. • Size: CHS, CHL, S, M, L, XL • Color: Black, Red, White, Blue, Pink ..
Contructed from a flexible light weight material, making it comfortable and easy to wear. 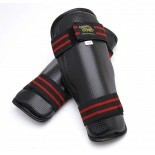 Durable EVA material provides extra protection and promotes better traction to prevent injuries. Also features velcro system allowing easy wear/removal, spandex fabric for ventilation/comfort, and special sponge padding for sweat absorption. .. 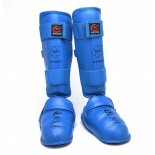 ROBOT KICKS provide all-around coverage for the foot and ankle with quality vinyl covered foam. 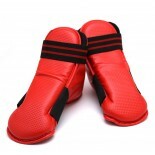 For better balance and mobility, the bottom of the kicks are left open. 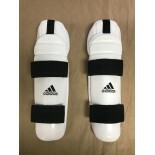 An elastic strap with a hook and loop (Velcro) closure wraps around the ankle to provide a comfortable, secure fit. Color: Black, Red Size: CHS(1), CHL(3), S(5), M(7), L(9), XL(11), XXL(13), XXXL(14) .. 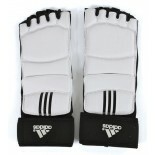 Constructed using flexible and light weight materials, making it comfortable and easy to wear. Spandex fabric promotes ventilation, and sponge padding absorbs excess moisture. Color: White, Black Size: CHS, CHL, S, M, L, XL ..